Easy Access to ALL your Jewelry In One Spot. Fits nicely in your closet, and each piece has its own place, so they don't get tangled (or worse, scratched or nicked!). Now it's easy to quickly find that favorite piece of jewelry, AND to keep them organized when you put them back. Saves Dresser and Counter Space. No more bulky jewelry boxes piling up on your dresser or counter--and no more stuffing things in overcrowded boxes where you can't see or find them.Includes a Beautiful Satin Hanger! Our Little Dress Organizer comes with its own beautiful Satin Hanger, so no searching for a hanger to fit AND support the weight of your things.Makes Beautiful Wall Art. Brighten up your room by hanging it on the wall or the back of the door and display all your beautiful things. Use it for makeup, nail accessories, crafts, sewing items... all of life's little necessities!Description. 24 clear pockets, 17 velcro hooks (5 in. long hooks hold your chunky Necklaces and Bracelets). Dress is 36 in. long, 12 in. waist, 17.5 in. bottom. Pockets 3.5 in. wide x 2.5 in. high. Wider pockets down the center; deeper and wider lower row pockets. Non-woven fabric (strong, durable textile used in products like grocery bags).Makes a Great Gift! 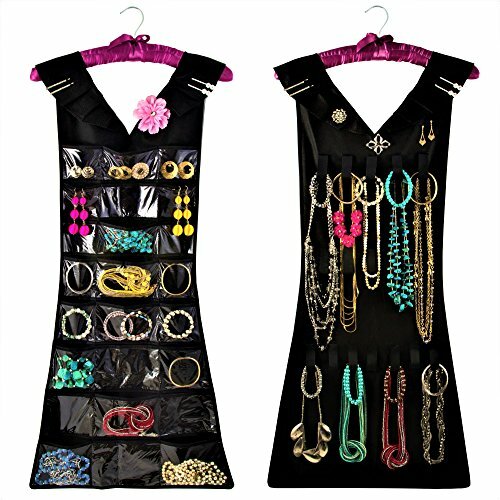 Our Little Dress Organizer is great for all ages and makes a great gift! !Our No Risk Guarantee. We are so confident that our Little Dress Organizer will be exactly what you're looking for, that if for any reason you are not completely satisfied, please return the product and we will promptly give you a full refund, no questions asked.DON'T MISS OUT ON THIS GREAT OFFER! Click the yellow Add to Cart button, top right, and order yours now!! NO MORE TANGLED JEWELRY BOXES or cluttered shelves & drawers. "Effortlessly organize" is what our customers say, that it's the "perfect solution". Our Little Dress Organizer hangs in your closet or on the wall and it's large enough to hold ALL your things, at 36 in. tall and 12 in. wide (17 in. wide at the bottom), it's full dress size. SATIN HANGER INCLUDED - No need to search for a hanger that will hopefully fit your organizer - we include a beautiful (and strong!) Satin Hanger. And unlike other organizers, OUR hooks are 4 in. long, long enough to hold your most chunky necklaces, bracelets and earrings. RELIEF! What a relief to go from cluttered and tangled mess - to organized and efficient. 17 long velcro hooks & 24 clear pockets hold ALL your Jewelry, even Hair Accessories, Nail Polish, Makeup, Crafts, you name it! MAKE YOUR BUSY MORNINGS LESS STRESSFUL. No more searching - or worse yet, losing track of your things! Our Little Dress Organizer is large enough to hold all your things, AND now you can see everything at a glance (in one place! ), and easily pick the one you want to use. CUSTOMER SERVICE IS ALIVE AT MARCUS MAYFIELD. We offer complete satisfaction, nothing less. We feel that you, our customers, are the most important part of our business - and we back that up with our actions. If for any reason you are not completely satisfied with any of our products, we will replace or refund your order, no questions asked. CONTACT US directly so we can help with whatever is needed. If you have any questions about this product by Marcus Mayfield, contact us by completing and submitting the form below. If you are looking for a specif part number, please include it with your message.